Try this tasty carrot dish with a spicy Middle Eastern main, such as a chicken tagine. 1. Wash the baby carrots well. 2. Bring a pot of salted water to the boil and cook the carrots for a few minutes, until tender, refresh in ice water and drain. 3. 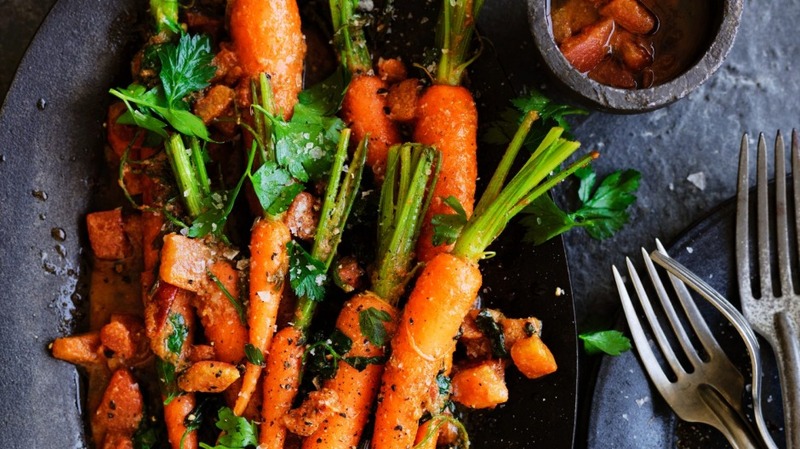 In a large frying pan, heat extra virgin olive oil and fry the carrots for 30 seconds and then carefully add the parsley to the hot oil – it will spit a fair bit. 4. Add the tomato, cumin and some sea salt to the pan and toss with the parsley for 1-2 minutes over a low heat taking care not to burn the cumin. 5. Add the lemon juice, check the seasoning, scatter with extra parsley and finish with a grind of pepper. 6. Spoon the carrots onto a plate and serve.